It's got the looks, but can it keep up with the big boys? The Ascend P6 shows that the Chinese manufacturer can really make an impression on the Android market with its stunningly slim - if slightly derivative - design, as well as some quirky features that mark it out as a little bit different. But it's playing catch-up to an ever strengthening pack. 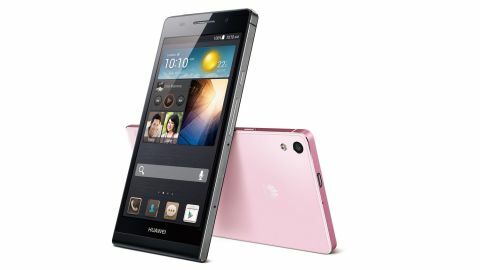 The Huawei Ascend P6 represents the Chinese smartphone manufacturer's biggest attempt yet to join the Android elite. It boasts a level of design and a range of quietly innovative features that are in many ways worthy of Samsung, HTC, LG and Sony at their best. Despite this, it's not quite in the same category as the absolute top-spec beasts such as the HTC One, Samsung Galaxy S4, and Sony Xperia Z. In fact, with its 4.7-inch 720p display and 8-megapixel camera it's closer in raw specs to the likes of the Google Nexus 4 and the Samsung Galaxy S3. Infact the Huawei Ascend P2 features slightly better specs such as a 13MP rear camera, although it's body isn't as premium as the P6's. Of course, with the phone set to be offered for around £25 per month on contract, the Ascend P6 will also be considerably cheaper than the current top crop. You might even call it an upper-mid range device. But you get the feeling Huawei is taking a slightly different approach here. With some of its sleek hardware, software design cues and focus on style and functionality over willy-waving specs, the Huawei Ascend P6 appears to be following Apple's lead more than any of the aforementioned Android giants. It's immediately clear the moment you take it out of its classy, compact white box. The super-slim, squared-off body, flat surfaces and metallic rim are pure iPhone 5 (though the colouring of our black model is closer to the iPhone 4S). It even comes with its own pre-packed 'bumper', but don't worry - we didn't notice any death-grip issues. That's not to say that the Huawei Ascend P6 is a straight-ahead iPhone knock-off - its rounded bottom edge and subtly textured rear see off that charge. Unlike the major devices listed above, then, the Huawei Ascend P6 doesn't have a distinctive design language to call its own, but that doesn't mean it isn't a pleasure to hold and to look at. The handset's sleek design isn't just easy on the eye, either. At a shade under 6.2 mm thick, Huawei is claiming that this is the slimmest smartphone in the world. It's certainly a good 1.4 mm thinner than the iPhone 5 and a whopping 3.1 mm slimmer than the HTC One, which is the closest Android phone to this in terms of premium feel. At 120g, the Huawei Ascend P6 is also a good 10 grams lighter than the Samsung Galaxy S4 or the Google Nexus 4. All in all,the phone's lightness and slimness, allied to an extremely thin bezel, makes for a rare 4.7-inch smartphone that's viable to use one-handed - provided you have reasonably long flexible fingers, of course. Going back to that 4.7-inch display, whilst it's 'only' a 720p model - which means it can't compete with 1080p big-hitters like the HTC One for sheer sharpness - it is one of the better examples of its kind. Colour reproduction is excellent, and you can tweak the colour temperature within the settings menu if you're used to a warmer or cooler display. There's even a Magic Touch feature that enables you to use the phone with your gloves on, which is a fantastic thing to have when you live in a generally chilly country like the UK. This should really be in more smartphones by now, but so far it's only really Nokia (although the likes of Samsung and co. are getting on board slowly) that's adopted it with any enthusiasm. Well done Huawei. In terms of external ports and buttons, Huawei has made some interesting decisions. The power button and volume rocker placement is pretty tradition, up high on the right hand side. In both look and ultra-clicky feel they reminded us of the Asus PadFone 2 equivalents, which is no bad thing. The most notable thing on the controls front is the lack of physical or capacitive control keys. Rather, Huawei is one of the few third party manufacturers to follow Google's lead and opt for virtual buttons built into the UI (more on which in a moment). The ports are even more unorthodox. You'll find the microUSB port situated on the top edge of the Ascend P6, which is unusual in itself. But the truly out-there element here is the 3.5mm headphone jack, which is situated right at the bottom of the left hand edge. That would be odd enough, but then there's the bizarre metal nub-like cover that we initially mistook for a lanyard hook. Once removed, it turns out that it's a small drawing pin-shaped tool for accessing the Ascend P6's SIM and microSD trays. It looks quite stylish when in place and serves its purpose well when out and in use, but what do you do with this tiny metal object when you're using the headphone socket? Lose it, we suspect. Still, at least there is a microSD slot present to require such a tool. With a paltry 8GB of internal storage available here, additional memory is sorely needed. For music fans, gamers, and power users 8GB definitely won't be enough, so we're extremely glad that Huawei included a microSD slot - even if accessing it proves a little fiddly.